Home Articles Death from malaria accidental ? The answer of the Supreme Court in a recent judgment of the case – The Branch Manager, National Insurance Co. Ltd. v. Smt. Mousumi Bhattacharjee & Others ,delivered on March 26, 2019, is very emphatically in negative . The quite interesting question raised in the case was whether a death due to malaria occasioned by a mosquito bite in Mozambique , constituted death due to accident . The appeal by the insurer was filed against the judgment of the National Consumer Disputes Redressal Commission, which upheld a decision of the State Consumer Disputes Redressal Commission. In the first appeal, the State Commission had upheld the award of a claim under an insurance policy. As the law of insurance has developed, there has been a nuanced understanding of the distinction between an accident and a disease which is contracted in the natural course of human events in determining whether a policy of accident insurance would cover a disease. At one end of the spectrum is the theory that an accident postulates a mishap or an untoward happening, something which is unexpected and unforeseen. This understanding of what is an accident indicates that something which arises in the natural course of things is not an accident. This is the basis for holding that a disease may not fall for classification as an accident, when it is caused by a bodily infirmity or a condition. A person who suffers from flu or a viral fever cannot say that it is an accident. Of course, there is an element of chance or probability in contracting an illness. Even when viral disease has proliferated in an area, every individual may not suffer from it .Getting a bout of flu or viral illness may be a matter of chance. But a person who gets the flu cannot be described as having suffered an accident: the flu was transmitted during the natural course of things. To be bitten by a mosquito and be imbued with a malarial parasite does involve an element of chance. 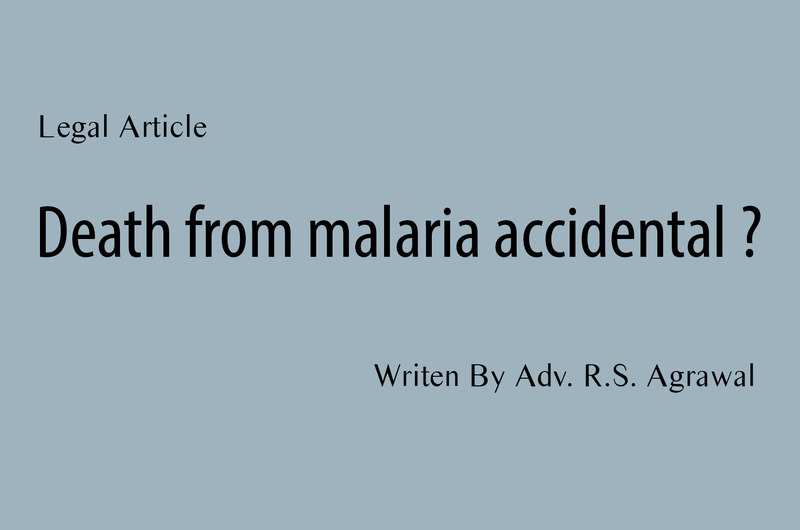 But the disease which is caused as a result of the insect bite in the natural course of events cannot be regarded as an accident .Particularly, when the disease is caused in area which is malaria prone. On the other hand, there well be instances where a bodily condition from which an individual suffers may be the direct consequence of an accident . A motor car accident may, for instance, result in bodily injuries, the consequence of which is death or disability which may fall within the cover of a policy of accident insurance. Hence, it has been postulated that where a disease is caused or transmitted in the natural course of events, it would not be covered by the definition of an accident. However, in a given case or circumstance, the affliction or bodily condition may be regarded as an accident where its cause or course of transmission is unexpected and unforeseen. Distinguishing a U.S. Court’s decision (16- 20831-5th Cir. 2018) with the facts of this case, the Supreme Court has observed that Malaria is most commonly transmitted to humans through malaria virus infested mosquito bites, and when a virus is contracted through normal means brought about by everyday life , it cannot be deemed to be an unexpected or unforeseen accident. In a policy of insurance which covers death due to accident , the peril insured against is an accident : an untoward happening or occurrence which is unforeseen and unexpected in the normal course of human events. The death of the insured in the present case was caused by encephalitis malaria. The claim under the policy is founded on the hypothesis that there is an element of uncertainty about whether or when a person would be the victim of a mosquito bite which is carrier of a vector-borne disease. The submission is that being bitten by a mosquito is an unforeseen eventuality and should be regarded as an accident. The Court did not approve of this submission. The insured was based in Mozambique. According to the World Health Organization –WHO’s World Malaria Report- 2018, Mozambique, with a population of 29.6 million people, accounts for 5% of cases of Malaria globally. It is also on record that one out of three people in Mozambique suffers from Malaria. In light of these statistics , the illness of encephalitis malaria through a mosquito bite cannot be considered as an accident. It was neither unexpected nor unforeseen. It was not a peril insured against in the policy of accident insurance. Hence, the Supreme Court has been of the view that the interpretation placed on the terms of the insurance policy was manifestly incorrect and that the impugned order of the National Commission is unsustainable. The insured was working as a Manager of a Tea Estate in Assam. Thereafter, I the year 2012 he joined a similar job as a Tea Factory Manager in Mozambique. During his stay there, he was admitted to the hospital on November 14, 2012. He was diagnosed with encephalitis malaria and died there on November 22, 2012 due to multi-organ failure. The heirs of the deceased filed a complaint under the Consumer Protection Act, 1986 before the District Forum, North 24 PGS, Barasat alleging that there was deficiency in service rendered by the insurer in not settling the claim under the insurance cover. On February 28, 2014, the District Forum allowed the claim and ordered the insurer to pay the entire outstanding EMIs in respect of the loan to the Bank of Baroda. In appeal by the insurer, on February 2, 2016, the State Commission affirmed the District Forum’s order holding that a “sudden death due to mosquito bite in a foreign land” was an accident: It would be rather silly to say that it was a natural death. In revision, the National Commission upheld the verdicts of the two Forums below and observed that “it would be difficult to accept the (insurer’s) contention that malaria due to mosquito bite is a disease and not an accident”. During the course of hearing, the Supreme Court was informed that the claim under the insurance policy has been paid by the insurer. The Court directed, in exercise of its jurisdiction under Article 142 of the Constitution that no recoveries shall be made .The Court said that it took up this case since the issue raised in the present case will have a bearing on similar questions of interpretation in policies of insurance envisaging an accident cover. The Supreme Court has set aside the impugned order passed by the National Commission and allowed the appeal.